This month’s challenge was to create with monograms. Not something I do a lot of but isn’t that why they call it a ‘challenge’ and not an ‘easy’!? hee hee! 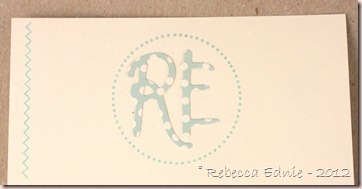 I decided to make myself a pretty set of monogrammed notecards. I never have a decent thing to write a note on to the teacher despite having literally reams worth of GORGEOUS paper! Absolutely disgusting! So I was happy to finally have something nice to write on. 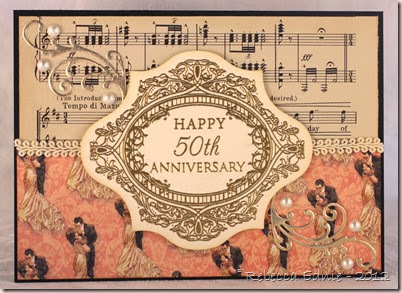 I plan to make a few more like these and a few more with just stamping and the monogram for when I need more space plus they will take less time to make. 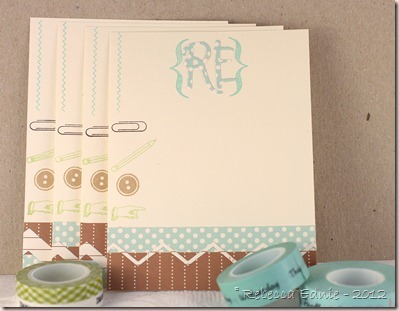 I may even stamp the monogram instead of die cutting it saving even more time. 4 was plenty for now considering I’ve just finished making 230 wedding favours for my sister’s wedding! Kinda sick of multiples for a while. I’m going to have a tutorial soon with tips on die cutting and stamping huge quantities of items! Stay tuned or check back if you are new to my blog. Many of you may be new today so you don’t know me. But I am, in the words of Tim Gunn (Project Runway), a “make it work” type of person. So I rarely throw a card in the trash. An element or two maybe but even that is rare. So when a comedy of errors befell these cards, I made them work! First, my stupid cutter’s blade was dull so my papers had whiskers. So I trimmed them off with a scissors. Then I was adding the monograms and using a fine tipped bottle of glue. It virtually never clogs so I just kept adding more and more pressure to get the darn glue out until… you guessed it, a gigantic blob of glue landed on my notecard! Fortunately, it wasn’t the kind that sinks down into the paper so I used an adhesive eraser once it was dry! 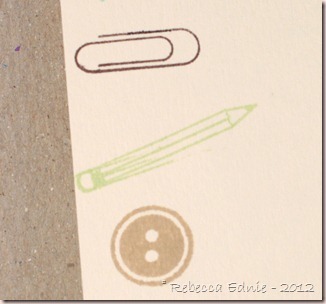 I laid out all my stamps along the left edge of the paper to arrange them. When the hand touched my acrylic block, the pencil too came for a ride even though I had moved it out of the way, just not far enough. I guess I inked the hand on the edge of the pad and didn’t ink the pencil so once I checked how it looked the first time, something I do when stamping multiples, especially with a stamp I’ve not used before, I went ahead and stamped the rest. I guess I hit the ink pad differently the other times because the pencil partially stamped and not in the colour or place I wanted it to. grrr… After saying bad things under my breath I tried stamping over. Nope, the lines were so thin, I couldn’t see them through my block and yes, it is clean! The solid end lined up. So, is this worth trashing, especially when it’s the last step? IMHO, nope! Seriously, its a note to the teacher. Does she care if the pencil isn’t lined up? Nope! So think about that the next time something is headed for the round file! Does it matter that much? If it is headed to CHA, then yes, save the flubbed one for grandma and redo it but otherwise, take a deep breath and move on! I have to work very hard to not obsess and take myself too seriously! My kids need me and I can’t spend all day in my craft room redoing things and it isn’t healthy. So make it work ladies! I hope you are enjoying the hop! If you like what you’ve seen or you don’t want to forget to come back for my assembly line die cutting and stamping tutorial or to see my wedding favours, be sure to subscribe by RSS or email subscription. They are both on my left sidebar. If you read this far, you are amazing and I thank you for visiting. Have a great day!